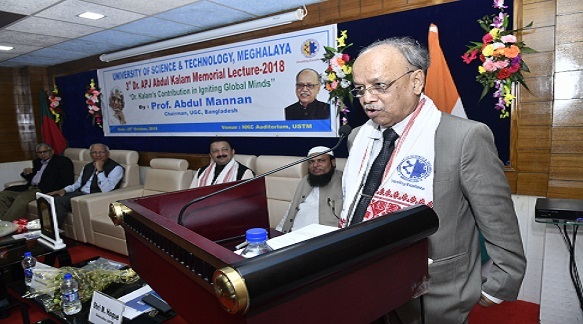 Chairman of University Grants Commission, Bangladesh Professor Abdul Mannan on Thursday delivered the 3rd Dr APJ Abdul Kalam Memorial Lecture on “Dr Kalam’s Contribution in Igniting Global Minds” at the University of Science & Technology Meghalaya. Bangladesh UGC Chairman Professor Abdul Mannan on Thursday delivered the 3rd Dr APJ Abdul Kalam Memorial Lecture on “Dr Kalam’s Contribution in Igniting Global Minds” at the University of Science & Technology, Meghalaya. The annual lecture was organized by the University in honour of Dr APJ Abdul Kalam. A host of students, teachers and dignitaries, including Prof Ved Prakash, formar UGC chairman, Prof Sanjay Deshmukh, former Vice Chancellor of Mumbai University, RK Pillai, MD, EDIBON International, Spain, Dr Shah Mohammad Tanvir Monsur, Assistant High Commissioner of Bangladesh attended the programme. Delivering his lecture, Prof Abdul Mannan said he reveres Dr APJ Abdul Kalam first as a teacher then as a scientist and finally, as the former President of India. “Throughout his life late Dr Kalam tried to motivate his country’s people and its youth because he saw the future of a nation lay especially with them, how they are groomed and from human beings transformed into human resources. This is more than ever true for countries in Asia, a continent that has been ravaged and plundered by colonial powers for centuries,” he said. The UGC Chairman of Bangladesh said that now is time to discuss the Fourth Industrial Revolution that is knocking at the door. “The advent of the Fourth Industrial Revolution has made knowledge-based societies a reality. This revolution will determine the future destination of nations and its driving force is human intelligence, innovation and the ability to see the future. All three determinants of the future of nations and mankind are embedded in human beings. To keep pace with the demands of time, it has now become imperative to master the ability to integrate these three determinants and create synergy,” Dr Mannan said. According to Prof Mannan the emergence of Artificial Intelligence is now a reality. To survive in such an uncomfortable world, societies and countries must realize it will not be possible to save or retain jobs but attempts must be made to provide security to people in terms of skills which can only be possible by providing appropriate education and training. Prof Mannan said that India may be the world’s number one economic power in terms of PPP but to hold on to that position is a big challenge. The key to confronting this is to invest in human development on a continuous basis, opening up windows to a newer world of knowledge and acknowledging that the real wealth of any nation lies in its people and not in its natural resources.